I have just one picture of Lovie. And I am glad that I do. I have a few pictures of Happy and Aie Choo Choo too. 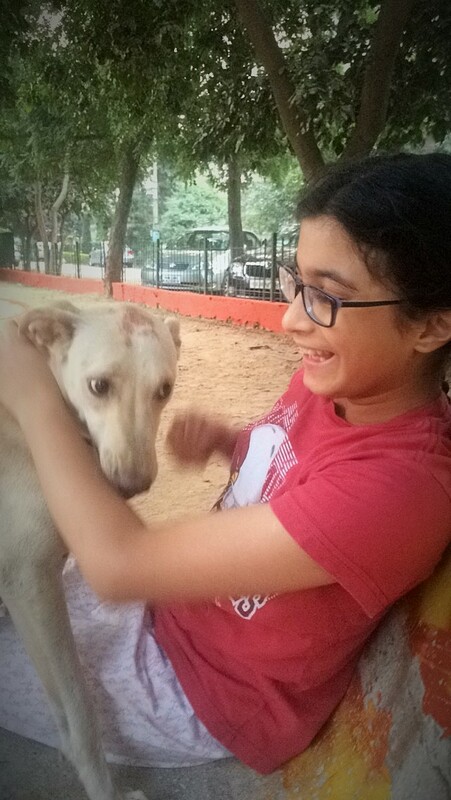 These are the names given by my daughter to our frequently-visiting stray dogs. Happy always looks happy so she was named Happy. People always try to shoo the other one away and keep saying, among many expressions, “Aie Choo Choo” and hence he was named the same. And Lovie was named Lovie because she was so affectionate, so lovable. She would be wagging her tail and climbing onto our legs every time she would catch the sight of us. She came to our neighbourhood quite late as I hadn’t noticed her before. A month later after witnessing a handful of dogs after her I realised she wasn’t neutered. I wondered if it was too late to get her neutered now when she was on heat. Other than donating money sporadically to animal welfare organisations (AWO) I haven’t done anything active as such for the cause of animals as much as I would like to and I do admit that I don’t have that volunteering spirit in me (read:boldness). So was this a calling for me, I wondered. I had to do something for her. I could see her getting tired with all those dogs vying for her. I called up our local AWO who explained to me that the dogs can get neutered even when they are on heat. They would be happy to help me. The process was relatively simple: They call you an hour before they come to pick up the dog. You chain the dog before they arrive. The dog is then neutered and kept with them for 2 more days as a post-operative care. Easy. The only bit that I wasn’t comfortable with was that they returned the dog to the same person who handed it to them. Why would they return Lovie to me? She didn’t belong to me. I was just trying to be good. I nevertheless wanted to go ahead with this mission. I could of course release her once she was handed over to me. All I had to do now was to arrange for a dog chain and tie her an hour before they would pick her up. It was to happen the next day. I warmed up to the whole plan. After all I wasn’t going to be the first one who would be doing this. Somebody had already got Happy and Aie Choo Choo neutered before, along with many other stray dogs in our neighbourhood. So after unsuccessfully asking a few neighbour friends who owned dogs if they had a spare dog-chain (I must confess that in a way I was boasting too of the deed that I was going to perform.) I bought one from a pet store an evening before. Next day I saw Lovie roam in our lane with one alpha dog who didn’t let any other dog come close to her. He only subjugated before Lovie’s barks at him. The AWO was to call me up in the noon which they did. I looked out and couldn’t see Lovie. I took our domestic help along to search for her. “You are not doing the right thing,” my domestic help said to me unexpectedly. I understood what he was up to. Coming from a village, he has a conservative view on life, despite having two wives! “What do you mean?” I asked. “Lovie must have conceived. Why would you want the pups to be killed. Let her have babies this time and then you can get her neutered,” he said. “You know what will happen to all the stray pups, don’t you? Some of them will die of hunger and some will get crushed under the cars. So why should they come to life?” I said rhetorically. He just nodded his head from left to right and walked with me from street to street looking for Lovie. Unfortunately we couldn’t find her. I called up the AWO who were equally upset to hear this and told me to keep an eye for her and let them know if I found her in the next one hour. I didn’t. Well, at least I had tried. I didn’t see Lovie after that for nearly a week and when I did I was happy to notice a shaven patch on her left side of the body. It was as if somebody else had read my mind and got her neutered. I felt so thankful. At least a litter of stray pups were saved from being born in this cruel world and Lovie too was saved from going through the traumatic process. Every thing was fine. At least I thought so. After a week or two seeing Lovie in the neighbourhood I didn’t see her again then. She must have shifted her base, I thought, to a place where she was being fed better. Now that the weather was getting chillier, I even saw her wearing a coat and was happy that she was being specially taken care of. She had a new benefactor. Perhaps the same one who had got her neutered. And then I got to know. On a long journey last Saturday I asked my domestic help, who is also our driver, if he had seen Lovie. He looked at me from the rear view mirror of the car with a face of disgust. “I told you not to get her neutered,” he said. “She died,” he said in a staid tone. “So nobody helped her ?” I asked as I began to feel the shock. “Nobody got to know. She looked fine. And one fine morning she was found dead . The security guards then took her body away,” he said. I was speechless for a while and looked out of the window trying to grasp the entire conversation that had just taken place. I wished I had looked at Lovie one last time and spotted the signs of infection and taken some action. I wished she had climbed onto my legs one last time as I walked out of my house. Does our responsibility end after we have performed our duty/volunteering act? In this case, after the stray dog was neutered do we just shrug it off? I must admit I would have sent her to the streets right after she would have been back after the surgery. My job was done and I had done a good deed. Were 2 days of post-surgery care by the AWO enough? Or was I just passing the buck on to somebody else? Or like my domestic help said, was Lovie better off having the litter of pups this time? Did we play with nature and tried to hamper its course? He proved his point whereas I couldn’t. Only if Lovie had lived longer I would have told him how important it is to change his traditional way of thinking. I lost. The village boy won. Lovie’s blood is perhaps on our hands. Volunteers need to do beyond just this. What would I do if I was to come across a similar situation in the future? Will I be then bold enough to resist my parents, and some neighbours who disapprove of the acts of the stray dogs in our area and get the dog neutered? More than that, will I be able to give shelter to the just-operated dog for a few days? Or will I just ignore like most of the people around me and carry on with my work and just give that one-off donation to an AWO? I don’t know.